Larry Jenkins, a man I owe a lot to. 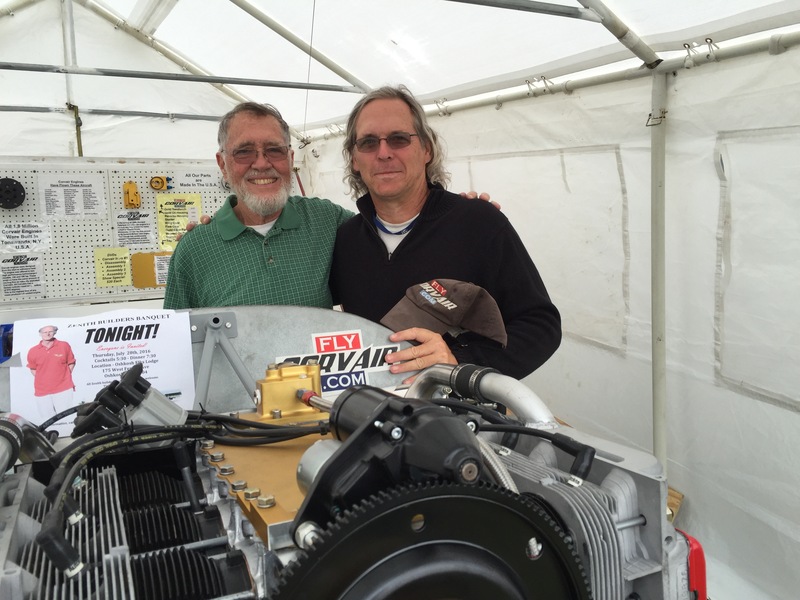 Above, in our Oshkosh tent with Larry Jenkins. 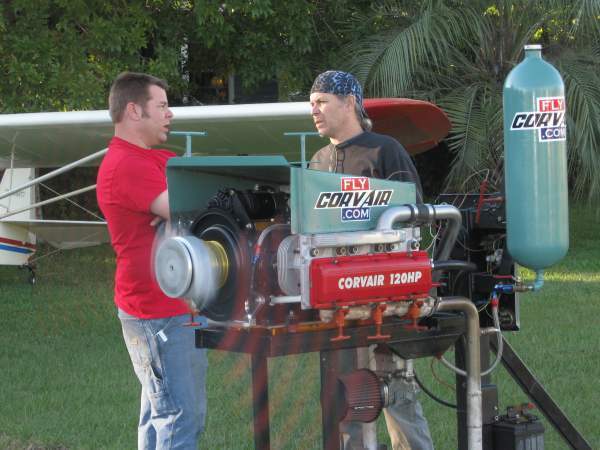 In 1989, Larry was an instructor at Embry-Riddle, president of EAA chapter 288 (Daytona Beach) and a RV-6 builder. He went above and beyond to encourage students to become home builders, including inviting them to meetings and to his workshop. It took Larry’s extraordinary optimism to believe that a significant number of converts could be made. I can’t answer for other students, but speaking for myself, my path in aviation was illuminated by this man, and I remain most grateful for it. I flew back to Florida yesterday to pack for the drive to Oshkosh. 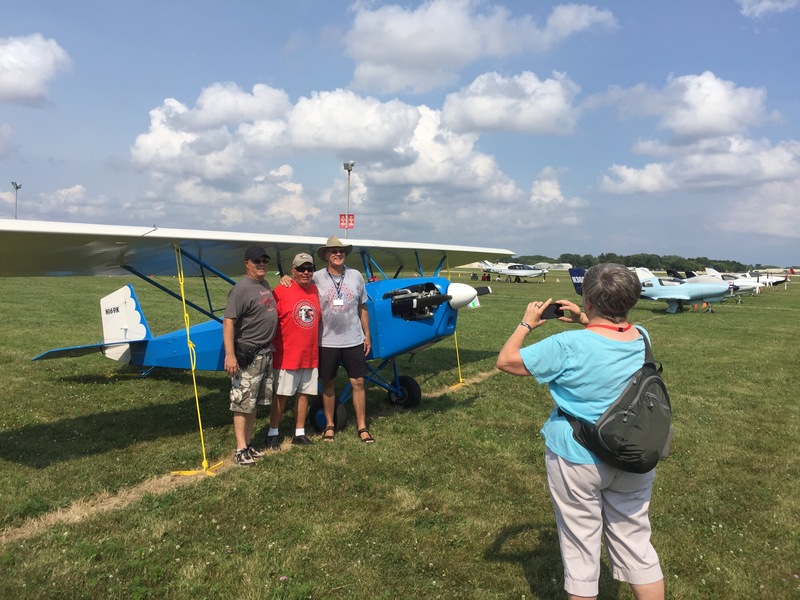 I have been to Airventure many times, missing only one year in the last twenty. 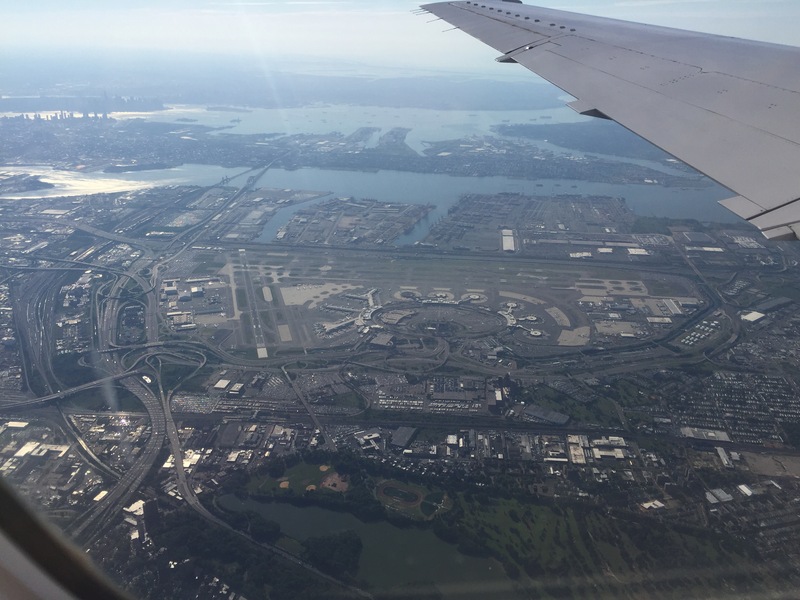 Above, the view of Newark from seat 23A a few minutes after departing on 4L and then turning south. Lower Manhattan, the 6000′ span of the Veranzano bridge and the Statue of Liberty were all visible. Dozens of other landmarks are indenifiable to anyone who once lived here. You don’t have to love everything about NYC to appreciate its cultural magnitude in the world. There are countless fine urban places on earth, but there is only one universally known as “The City.” If the loss of five officers in Dallas touched something inside you, consider that the people here are tough enough to have withstood the loss of 363 people in uniform in a single morning. If you go to old magazines and look at the Oshkosh coverage from years past, it is obvious that most of it was about new and exciting products that were promised to revolutionize home building. These stories were written to entertain the daydreams and fantasies of people who were going to build something “someday .” About 90% of these companies failed, not just because their ideals were mostly rainbow colored unicorn dung, but also because the people they were speaking with were perpetual spectators, and their new product was often aimed at making it easier to these people to ‘become’ a home builder. This is folly because you can’t make anything quick enough to build for someone who is never going to build anything, simply because they have been fed the entertainment diet of a spectator instead of being offered the information diet of a builder. Neither you nor I can change our industry, ( trust me, I speak from experience on this ) However, it is completely within our control to decide for ourselves that we will not be one of the perpetual spectators, that our place is in the actual Arena of home building. For the individuals who make this decision for themselves, we offer a proven path and products with an uninterrupted 27 year track record of serving traditional home builders, people who are looking to find out how much they can get out of home building, not how little. There was once a time when the word “Truck” designated a vehicle that was defined by doing work. Somewhere along the way to suburbia and middle age Americans forgot the simple joy of basic trucks, and went down the path of making them expensive, complicated, difficult to work on, and devoid of sensory experience. There is an aviation analogy of how we went from enjoying a J-3 as a great plane to discovering that a $200k euro-912 gps LSA is only a better experience in the eyes of an AOPA editor. I got my drivers license in 1978, although I have owned a number of Chevrolet Corvairs and two 1960s Buicks, the majority of my driving has been in Chevy and GMC trucks. I have never owned an import, nor have I ever owned a new car or truck. Between payments, insurance and service I never had, perhaps a saved $250k. Not really a lot spread over all those years, but I would argue the reward was the self reliance. In 38 years of driving, I have only called a tow truck once. I have plenty of friends who always bought new, swore by import quality, never drove stuff after it was 5 years old, all because they “need something reliable” , and I am pretty sure these guys always had triple A and used it at least every other year. For what it’s worth, I have caused exactly one accident since 1978. In 1992 I side swiped a parked car. I have been a passenger in a few others, but I have not even scraped another car in a parking lot, in spite of these trucks having no modern ‘safety ‘ features. Avoiding accidents has a lot more to do with the driver than the vehicle, but you could never explain that in s society where very few people ever see things as their fault. . Above, the suburbans dash after the western tour. 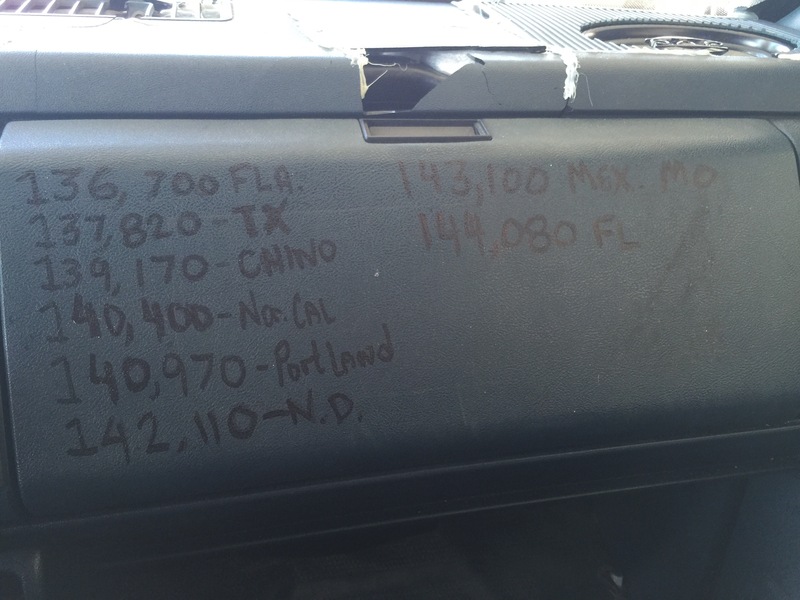 Remember when a truck could be its own log book, tool box and trash can? We have given up more than we have received, and that is the essential message of simplicity. 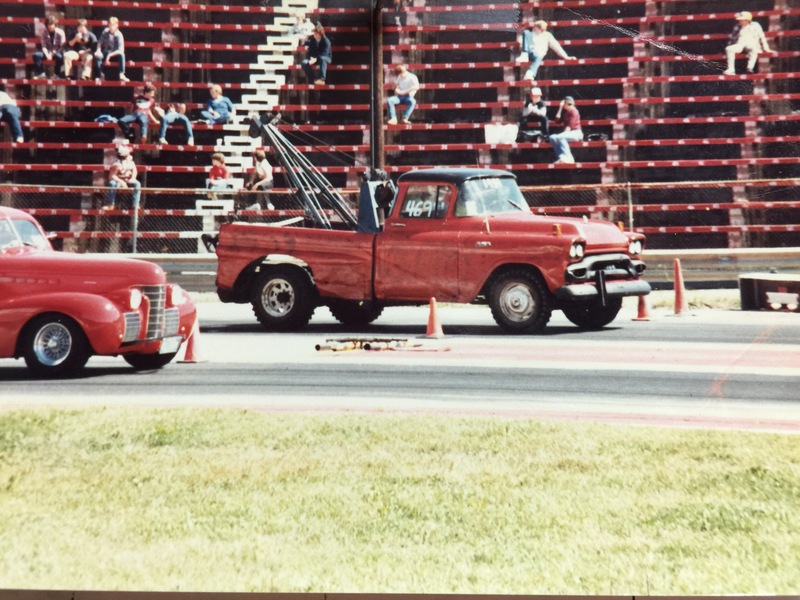 Above, my ’59 GMC making a practice run at the actual Englishtown NJ drag strip in 1984. 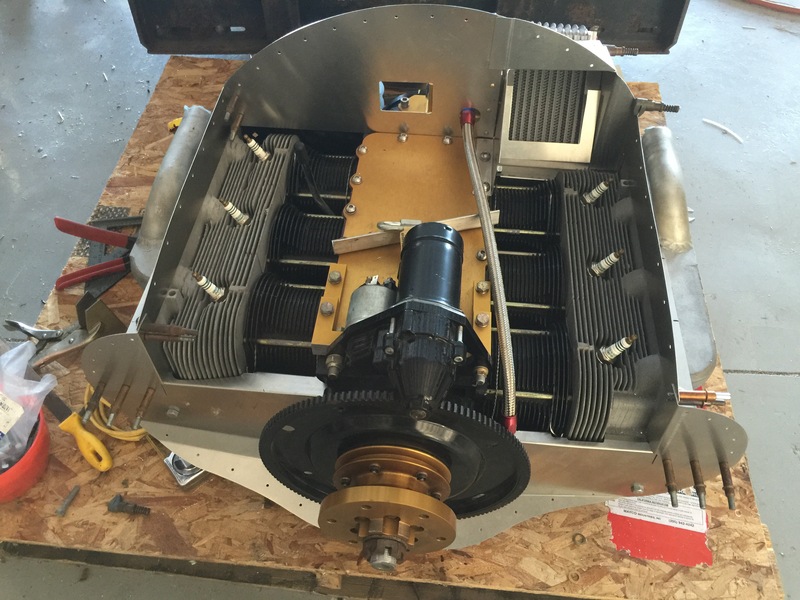 It was geared so low it hit terminal velocity (57 mph) in 600′. It ran 23.35 seconds in the quarter mile. Don’t laugh, it beat a stock Super Beetle that day. I used the truck to recycle cars during the period of astronomically high scrap prices in 1983-84. Below is a selected list of my old fleet. The number in parentheses is how old the truck was when I got it, followed by the price I paid. The second line is engine, trams and axle ratio. It’s ironic that people couldn’t understand why I drove a 17 year old truck in high school, and today my suburban is 23 years old, my pick up is 30, and my Corvair Convertible is 50 this year. It is a hard day when you suddenly realize you have become that “crazy old man with antique cars” you remember from your home town. Driven 40k, traded for Thermoquad carb. Driven 75k , sold for $450. Driven 100k, sold in parts. Driven 200k, sold for $400. Driven from 160k to 300k, scrapped. In this political season, opposing perspectives will attempt to portray the other side of the aisle as nothing short of evil. Tonight I share a New York Times obituary and a disturbing souvenir from the Wynne family china cabinet as a reminder of what real political evil actually is. 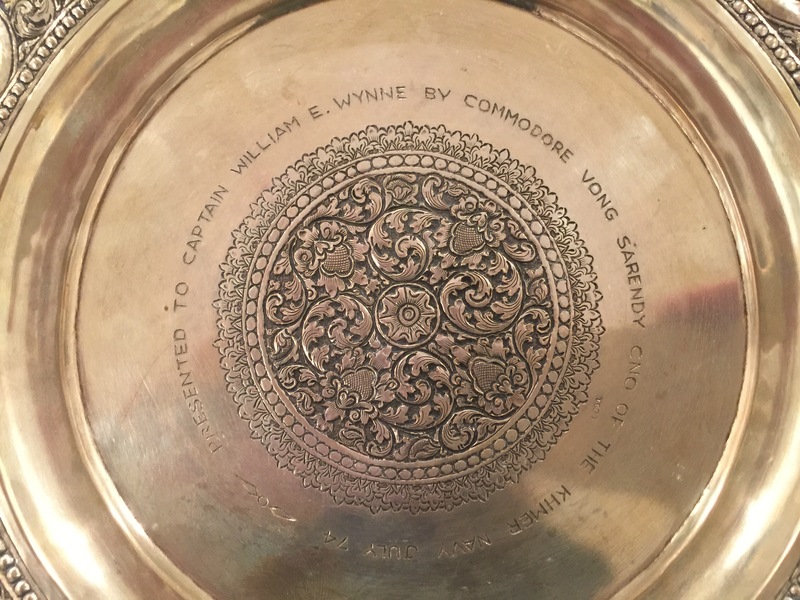 Above, a silver plate from Commodore Vong Sarendy, Chief of Naval Operations of the Cambodian Navy, presented to my father in the summer of 1974. It was to express his country’s gratitude for my father’s extraordinary efforts to thwart the Cambodian Communists in his country’s civil war. It was a bitter presentation, as US support for the democratic government was faltering, in spite of JFK’s call to arms that we would “Pay any Price, bear any burden and meet any hardship to insure the survival of liberty.” Sarendy said to my father that the Americans could go home, but he and his family would stay and fight to the death. Within a year, they had perished, the Khmer Rouge owned the country, and the Satanic Pol Pot began a systematic genocide that took the lives of two million people, 25% of the people in the country. During the four years it took to fill up the 20,000 mass graves, China was Pol Pot’s tireless supporter, supplying tens of thousands of soldiers to assist him. 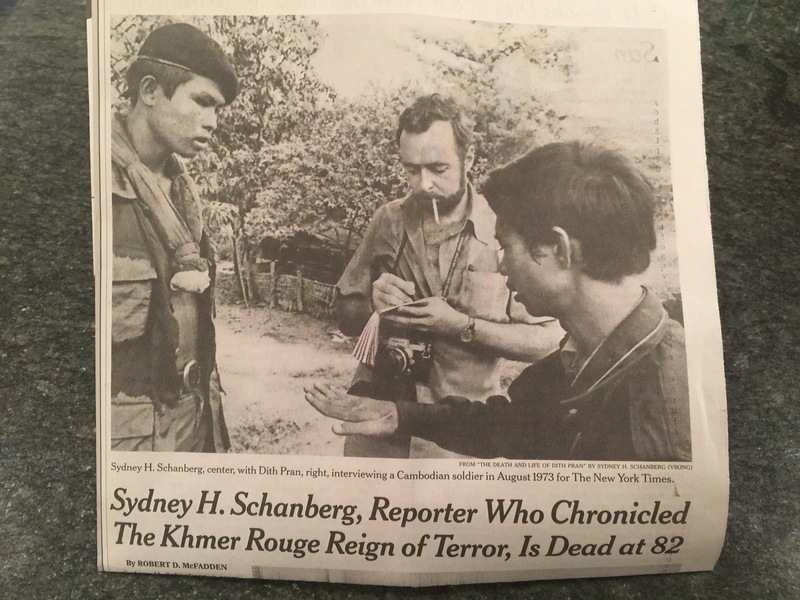 Above, the NYT obituary of Sydney Schanberg from July 10th. He won a Pulitzer Prize for his work attempting to warn the western world that the Khmer Rouge were as vicious as the Nazis. His writings were the basis of the 1984 film “The Killing Fields. ” Schanberg is in the center smoking. On the right is his assistant Dith Pran who went on to survive four years in some of the most brutal tourture camps of the 20th century. It is now the middle of the night, and I sit a quiet watch at his bedside. My sister will relieve me at 6am. Through the long night I will type this and spend the hours looking for the words to express my father’s absolute hatred of Satanic totalitarian political movements and the carnage they have caused to humanity. From the time he swore into the US Navy at age 17, my father has been willing to give anything, including his life, to defeat Evil regimes. Then it was the Facists and the cult of death Hirohito preached. Today it is ISIS, and somewhere in between, in the 1970s it was the Khmer Rouge. The earth has supplied an endless stream of Satanic tyrants, but in my father’s view, this didn’t justify accepting the existence of any of them. Tomorrow I could turn on any cable news station, or read countless Face Book pages, and within minutes I could see someone call their political adversaries Nazis, Evil or Satanic. This might be just a sad joke, except for the fact there are Americans among us who know what real evil is. I am not a blind fan of either party or their candidates, but I can discern between today’s crop of ethically challenged offerings and a purely evil entity like Pol Pot. No matter who is elected in November, our country will go on, and anyone who suggests we are headed for the national nightmare Cambodia experienced is paranoid or emotionally unstable. A few miles from my house is a simple convenience store called “Hwy. 17 Beverage.” When I walked in ten years ago, the owner and family patriarch was slightly stunned that I could tell is family was from Cambodia. He mentioned that no other neighbor in rural Florida had understood this. He went on to say he had survived his country’s own holocaust, but had come to accept that the great majority of the people born in his adoptive country didn’t have the slightest idea of how fourtunate the are. When I think of this man watching a national debate or reading extreme political opinions on Face Book, I cringe, and harbor the hope he has a great sense of tolerance and a generous sense of understanding . 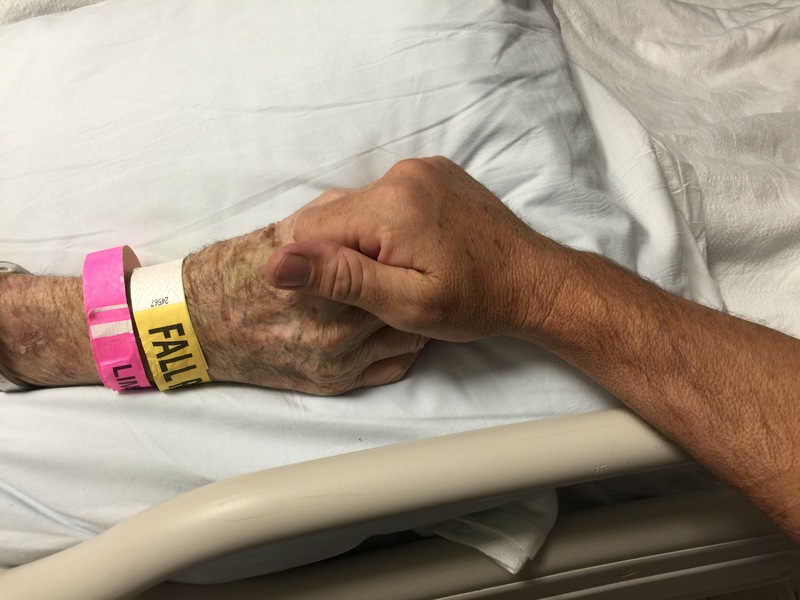 Above, I hold my father’s hand as he sleeps. This is the hand which held me the day I was born, the hand which taught me to write, the hand that shook mine the day I graduated from College. In this hour I sit beside his bed and consider with great humility, just how small my life would have been without him. Pearl Buck was an American woman with very progressive ideas on the value of human lives, particularly the lives of the voiceless impoverished of Asia. In 1938 she was awarded the Noble Prize for literature, for her novel “The Good Earth.” Buck was deeply concerned with the rights of women at a time when the world was not. After WWII, Buck used her power and wealth to set up orphanages, schools and adoption agencies across Asia, focused on caring for mixed race children who were treated as unadoptable and without human value, not just in their countries, but sadly in ours as well. The year I was born, there was a girl born in the slums of Manilla. As an Amer-Asian she had no value nor future in her society. By great fortune, the Pearl Buck Foundation had a place for her. A cynic could question the value of such places, even say it isn’t an Americans place to impose our values in other cultures. A cynic could do this, but I can’t for the simplest of reasons: that tiny girl in Manilla is today the highly experienced pulmonary Doctor who is directing the care of my father tonight. In a season where it has become acceptable to proclaim that America is either a commercial enterprise worshiping wealth or a playground for empathy-free narsisists, it is good to pause and remind ourselves the America which is worthy of our devotion is actually a set of ideals, focused on the human rights of individuals and the common humanity of people. While there are is large number of people born in this land who have willfully forgotten this, I can assure you there are many people in the world who understand that America, although flawed, is still the shining city on the hill, a land of ideals which has produced and shielded many champions of human dignity. A person exposed to just popular culture and media could cynically question this, but I have met a woman in New Jersey who could change their mind.